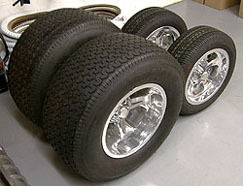 At the Street Rod Nationals in Louisville '98, I was lucky enough to win a set of Mehelich Wheels! I don't usually win anything, so winning a cool set of wheels like this was just awesome! I was sitting there enjoying the AC during the awards presentation and they were asking winners to please speak up when they won. I remember questioning whether I'd be bold enough to yell out in a crowd that large. Next thing I knew they were calling my number! Whithout thinking I yelled YES! at the top of my voice and ran down to the stage. Guess that answers my question. My thanks to Southern Rods & Parts and the NSRA for the wonderful prize. The Wheels are Mehelich Cruzer 15x10 rears and 14x6 fronts with knock-offs. The tires are Mickey Thompson 29/12.5-15's and Kumho 185/60-14's. This is what they call ''big-n-littles''!